Malaysia (5): Golf in Malaysia ranges from merely average to PGA quality. The best Malaysia golf courses are all located in the capital of Kuala Lumpur. Access is mostly private, but some weekday visitors are allowed at Kuala Lumpur Golf & Country Club and Saujana Golf & Country Club; both of which have hosted PGA and LPGA events, respectively. Thailand (7): Thailand golf courses have hosted many professional events such as the Royal Trophy (Black Mountain) and Honda LPGA (Siam Country Club), Volvo Masters (Thai Country Club), and Thailand Golf Championship (Amata Spring Country Club). The collection of Thailand’s best golf courses can be found at Golf In A Kingdom. Malaysia (5): Golf in Malaysia is well developed. However, the service aspect is generally lacking as there are very few locals who want to work in hospitality service roles. On the other hand English is widely spoken and getting to/from the golf courses is very easy. Also, most golf courses have nice clubhouses which make for good 19th holes. Thailand (10): The golf in Thailand is all about smiles. Friendly locals and caddies are all over Thai golf courses. Even if you hit a bad shot, your caddie will smile graciously and make you feel OK. Try playing on your own when you get back from a Thailand golf holiday! It will be then when you really miss the Thai service. 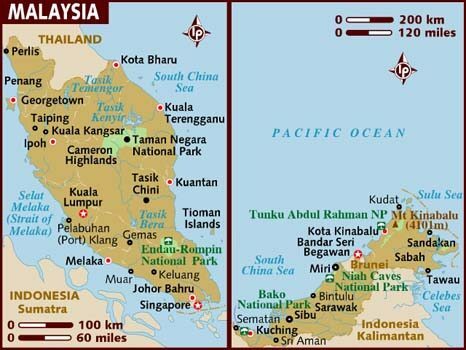 Malaysia (7): Malaysia is a country of varieties and home to a wide assortment of golf experiences. Golf can be played in the mountains, in a rainforest, along the beaches, or in a big city. A Malaysia golf holiday offers a variety of experiences to suit the preferences of every golfer. Thailand (10): As a top tourist destination Thailand stands out with great golfing experiences too. Its people, sights and world renowned nightlife insure great golfing experiences both on and off the course. Golf in A Kingdom should be tried by all golfers to see what the entire buzz is about. Malaysia (6): The best golf in Malaysia is expensive. Green fees are $150US at the top courses on weekends in Kuala Lumpur. Hotels and food are reasonable, but alcoholic beverages can be expensive. Less expensive golf for around $50US a round can be found in Kota Kinabalu and Langkawi, which are also both popular tourist destinations. Thailand (8): Green fees at top Thailand golf courses are also expensive at $100 – 150 US. However, hotels, transportation, food and drink, and entertainment are all affordable compared to other world-class destinations. Overall golf trip costs are lower than expected from just the green fees and represent good value-for-money. Malaysia (6.00): Malaysia is a solid golf destination with allot of variety. Service could be better, but with so much to do it is still highly recommended. While not quite up to Thailand standards, one idea is to combine both countries in one trip to get the best of both cultures. Thailand (8.70): Thailand beat Malaysia overall as a single golf destination. However, combined together they make for a unique Asia golf tour.